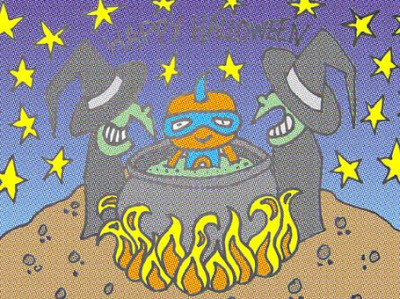 KawaiiPunk - Kawaii Mascot Blog: Hooray for Halloween! Yes, that’s right, it’s a lovely Halloween inspired picture of yourself being boiled alive in a cauldron by some horrible witches - after all, what better way could there possibly be for me to express my gratitude for all the fine Halloween work you’ve been doing here at this blog! Please keep up the good work, and pass on my regards to your colleagues, particularly the more monstrous ones among them!